Weakfish (Cynoscion regalis) occur along the Atlantic coast of North America from Nova Scotia to southeastern Florida, but are more common from New York to North Carolina. Warming of coastal waters in the spring prompts an inshore and northerly migration of adults from their offshore wintering grounds between Chesapeake Bay and Cape Lookout, North Carolina to nearshore sounds, bays, and estuaries. Spawning occurs shortly afterwards, peaking from April to June, with some geographical variation in timing. Females continuously produce eggs during the spawning season and release them over a period of time rather than once. In the fall, an offshore and southerly migration of adults coincides with declining water temperatures. Feeding on microscopic animals, larval weakfish journey from spawning areas to nursery areas, located in deeper portions of coastal rivers, bays, sounds, and estuaries. They remain in these areas until October to December of their first year, after which the juveniles migrate to the coast. 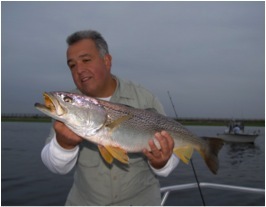 Growth in weakfish is especially rapid in the first year and they mature at a young age. Size at age-1 is variable but most fish are 10 to 11 inches long. As adults, weakfish are often found near the periphery of eelgrass beds, perhaps because weakfish feed primarily on shrimp, other crustaceans, and small fish that are found near these grass beds. Weakfish have been one of the most important components of a mixed-stock fishery on the Atlantic coast since the 1800s. In the late 1990s, however, weakfish biomass began to decline, reaching an all-time low of 342,990 pounds in 2011 (compared to 45.6 million pounds in 1981). 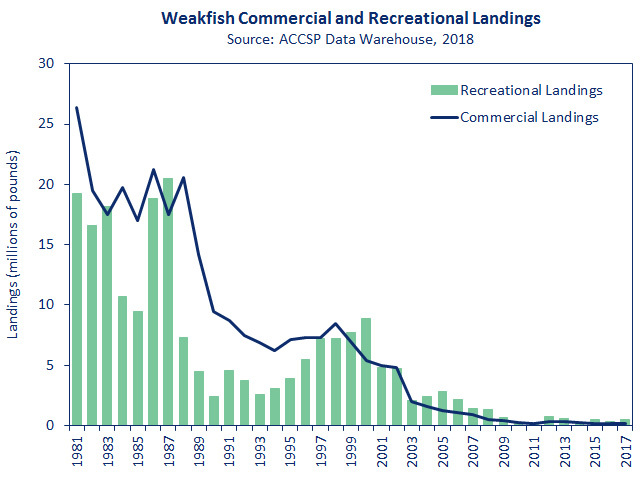 Total landings in the weakfish fishery have generally declined over the past two decades, with 2017 landings estimated at were 609,000 pounds, a 48% increase from 2016. From 1950 to 1970, commercial landings fluctuated without trend, ranging from three to nine million pounds. The early 1970s began a period of tremendous growth in the fishery, with landings peaking at 36 million pounds in 1980. Commercial landings have dramatically declined since the early 1980s, dropping from over 19 million pounds landed in 1982 to 167,000 pounds in 2017. The majority of landings occur in North Carolina and Virginia with gill nets as the primary gear. Commercial fishermen have been known to discard weakfish, especially in the mixed species trawl fishery, and the discard mortality is assumed to be 100%. Discards peaked in the 1990s but have since declined as the result of management measures and a decline in stock abundance. Recreational landings have followed a similar trend to that of commercial landings. After several harvests above 10 million pounds in the early 1980s, landings decreased to two million pounds by 1989, and hovered between one and two million pounds through the early 1990s. Harvest then increased to over four million pounds by the late 1990s, before exhibiting a decline like that in the commercial fishery. The 2011 recreational harvest also reached a historic low of below 27,081 pounds. Recreational landings in 2017 were 276,000 fish (436,000 pounds) and recreational releases were estimated at 1.5 million fish, a 65% increase in harvest (by numbers) and a 55% decrease in releases from 2016. Recreational harvest has been dominated by New Jersey, Delaware, Maryland, Virginia, and North Carolina. Recreational discard mortality is assumed to be 10% and has decreased with recreational catch. The 2016 Weakfish Benchmark Stock Assessment and Peer Review Report indicate weakfish is depleted and has been for the past 13 years. 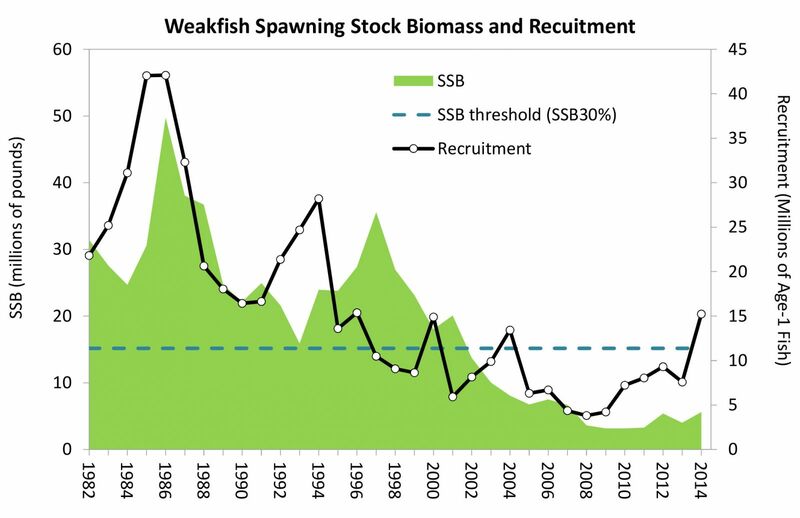 Under the new reference points, the stock is considered depleted when below a spawning stock biomass (SSB) threshold of 30% (15.17 million pounds). In 2014, SSB was 5.62 million pounds. While the assessment indicates some positive signs in the weakfish stock in the most recent years, with a slight increase in SSB and total abundance, the stock is still well below the SSB threshold. The assessment indicates natural mortality (e.g., the rate at which fish die due to natural causes such as predation, disease and starvation) has been increasing since the mid-1990s, from approximately 0.16 in the early 1980s to an average of 0.93 from 2007-2014. Therefore, even though fishing mortality has been at low levels in recent years, the weakfish population has been experiencing very high levels of total mortality (including fishing mortality and natural mortality), preventing the stock from recovering. To better address the issues impacting the weakfish resource, the Technical Committee recommends the use of total mortality (Z) benchmarks to prevent an increase in fishing pressure when natural mortality is high. The assessment proposes a total mortality target of 0.93 and threshold of 1.36. Total mortality in 2014 was 1.11, which is above the threshold but below the target, indicating that total mortality is still high but within acceptable limits. This is the first time in 13 years that Z has been below the threshold, and additional years of data are needed to determine whether estimates in Z in the most recent years will remain below the threshold. In 1985, as a result of population declines and limited biological information, the Atlantic States Marine Fisheries Commission developed an Interstate Fishery Management Plan (FMP) for Weakfish. Weakfish are currently managed under Amendment 4 to the FMP and its subsequent addenda (Addendum I-IV). Addendum IV requires states to implement a one fish recreational creel limit, 100 pound commercial trip limit, 100 pound commercial bycatch limit during closed seasons, and 100 undersized fish per trip allowance for the finfish trawl fishery. The Addendum's measures are intended to reduce the level of harvest without creating a large amount of discards and to poise the stock for recovery should natural mortality decrease in the future. In 2018, in response to concern regarding potential increases in commercial discards (in Virginia and North Carolina) due to the 100 pound trip limit, the Technical Committee reviewed discard information to determine whether current management is resulting in significant loss to the fishery through increased dead discards. The Technical Committee found that while notable increases in commercial discards were observed in Virginia and North Carolina in both 2016 and 2017, these singular points did not fit any long-term trend of increase and were not high enough to be a significant concern to the resource. The Technical Committee did not recommend any immediate action based on its analyses.